Well today wraps up our February Release Projects. We like to celebrate this day with a group post. What a great reason to give a gift! I have lots of people in my life that I feel make me want to be a better person. I love having a sentiment that tells them so! The sentiment comes from our Sensational Sentiments set. It is by far one of my favorites. I used last month’s template release of So Fortunate. I really wanted to focus on the fact that this is a SUPERB box/template without it having to be “Chinese take out” like themed. I really enjoyed using this with some older images. I did use the “flag” image from the What’s my fortune? Cookie Cut Filefor the pink layer (resized with my SCAL/Cricut). I kept the design simple and the colors striking. You don’t have to go all out to make an impact. The flowers on the main panel are from the Sensational Stems set. This is a fun and whimsical, build your own images, type of set. For the bottom of my tag, and top border of my main panel, I paired the images with the background building set Puckered Up Patterns. I LOVE all the pattern possibilities that set has to offer and used it earlier this week on the Day 1 Peek project. I have not yet filled this, but I have picked a recipient 😀 I know whomever receives this will know how much I appreciate them and the impact they have had on me. Well I hope you enjoyed all that was shared! 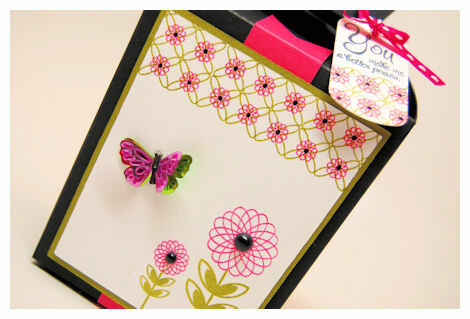 I’ll be back soon with more cards and gift ideas as the month move along and time allows. We are heading into a busy Chemo/Raditaion week for my mom. So prayers are being said she has a good week. 43 Responses for "A Year In Review: February"
Nice! love the bold contrast and simple elegance. Great packaging! Lovely! The colors really are so strinkingly beautiful! 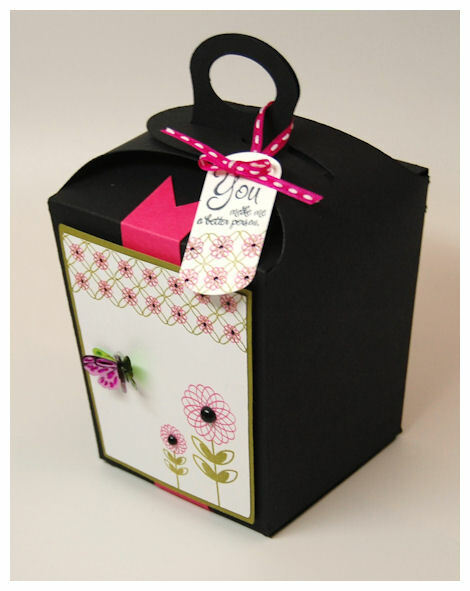 Your black cardstock looks like lacquer…it looks so shiny! Very pretty! I have always LOVED that stamp set! 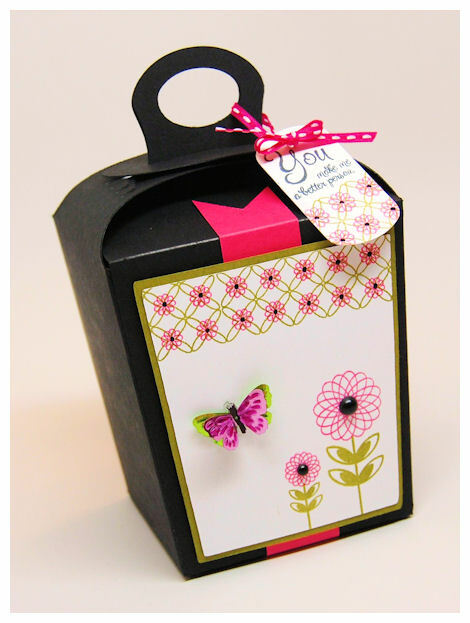 Great colors and a super fun package!!! What an absolute STUNNING color combo! I love this soooooooooooooo much! Great JOB!! Simply beautiful. You do such an amazing job of creating patterns – I love this patterned edge. As usual Lauren you AND your work are an inspiration!! Hang in there. THoughts are with you. Beautiful package! 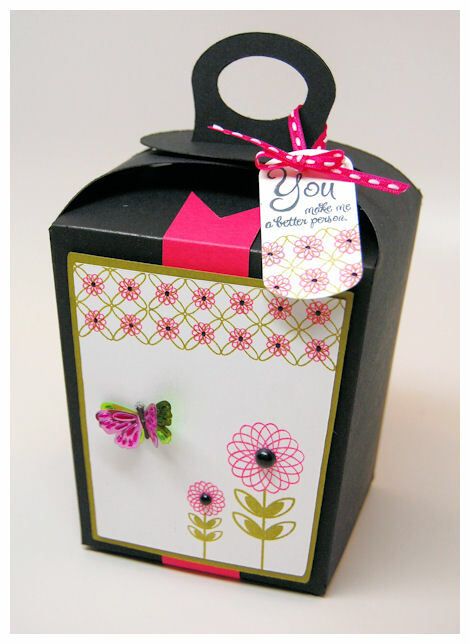 Love the bright colors you chose and the stamped images…so cheerful!! Is the butterfly from one of your sets? Love, love, love this package you made Lauren. The butterfly, of course, is just your perfect signature to something made with love. Nice box, especially with 3D touch. feet but, boots or shoes that come to the wearer with a soul of their own. The kind of boots or shoes that could have you wishing for more of them! There is a farmer, and acted at ease, but he said some impact on a lot of people say: Many of our people and interaction with others, always feel at a disadvantage. I love this kind of box. Could you tell me how to make it? Populations Canada Goose parka f Canada Geese have been on the increase over the last decade due to their protected status by both Federal and State agencies. USA bird control experts estimate there are approximately a dozen subspecies of Canada geese, ranging in size from 22 to 48 inches long and weighing from 3 pounds to 24 pounds. Regrettably, Canada geese like to graze and nest on corporate lawns and around fountains, as well as in parks and on golf course greens. These migratory birds have, of late, adopted the easy living conditions of urban environments, preferring to nest in protective vegetation. Canada geese are Canada Goose Womens Montebello Parka ighly aggressive and will run after animals and people–sometimes frightening children at parks. Trampling, defecating and eating, these geese cause considerable damage to agricultural crops, golf course lawns, reservoirs, ponds, and green belts. Geese roosting in open areas near airports have been known to create potentially dangerous bird strike collisions. Thanks for the tutorial and for the blog. The iphone ケース ブランド is set to enjoy life in trueNew Yorkstyle. Molded from premium silicone, it securely protects your iPhone 4 from bumps and scratches throughout the day and your travels. So take your iPhone 4 out of your bag, load up your favorite app, and enjoy your kate spadenew yorkCase for iphone ケース MARC JACOBS wherever you are. Find top Gm Tech 2 Scanner & save up to 75% on Gm Tech 2 Scanner!